Today: Gather around, grab a drink. This is the story of how applejack came to be, and you’ll want to listen closely -- it’s a good one. Colonists of 17th century America had a lot to worry about. They faced separation, dysentery, starvation, exposure, and harsh New England winters they weren’t prepared for. The next order of business, for those who made it through the first year, was to find a sustainable, hardy crop that grew quickly, yielded plenty, and didn’t need to be replanted. Enter: America's love affair with the apple. More: The love affair continues in Provisions. American colonists, being the great ancestors of an innovative people, immediately set to making hard cider and apple beer. Cider was quick, easy to make, and quickly became a staple on colonial tables. Best of all, cider, being 10% alcohol by volume, was safe to drink when the water was bad, which it frequently was. It was popular for every meal of the day, and especially breakfast. Now picture a cabin in colonial New England: The master of the house has his barrels of cider kept outside to cellar during the winter. It’s the first morning after a hard frost and said master is about to sit down to breakfast, so he goes out to fetch his normal morning beverage. Upon opening the cider keg he finds a pesky layer of frost, but realizes that he can scoop it out to get to the cider beneath. This scene repeats itself a few dozen times before the gentleman realizes that his mornings are becoming a bit fuzzy, and his afternoons downright incomprehensible. What we’ve just described is freeze-distillation. Water freezes at a higher temperature than alcohol does, so when a partially alcoholic beverage freezes, it’s mainly the water component that does so. By removing water, you are in effect increasing the concentration of the alcohol. Through this method alcohol can be increased from a quaffable 10% to a stumble-inducing 30 to 40%, or roughly the percentage of most vodkas. This process was further refined when pot stills were brought over from Europe, and applejack became the most popular spirit in colonial America, so much so that it was often used as a form of payment. The first ever distilling license was issued to Laird’s Distilling company, a purveyor of applejack, by George Washington himself. During Prohibition applejack all but disappeared -- but thanks to the cocktail revolution in which we now live, it's widely available again. (For authenticity look for the Lairds Bottled in Bond Apple Brandy.) 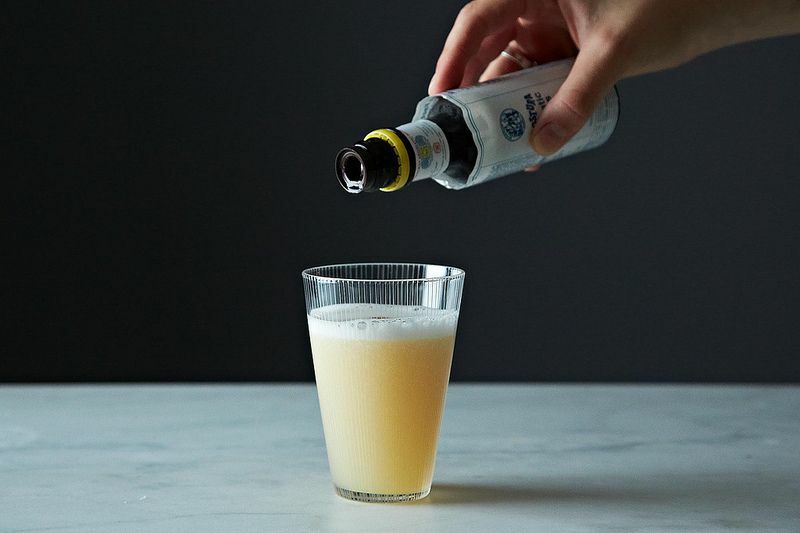 To drink it in true pioneer spirit, mix up an Apple Blow Fizz the next time you make brunch or breakfast at home -- just don’t make any plans for the rest of the day. 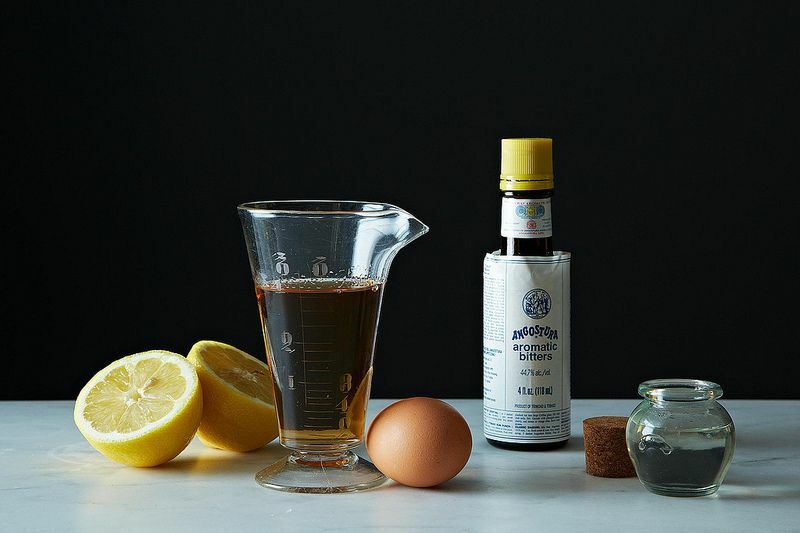 What classic cocktail recipe would you like to see here? Tell us in the comments! Yes I know I'm sheltered...what's a fizz glass? This looks quite fitting for the fall season. My favorite late fall/winter drink is the classic Old Fashioned but so many bartenders make it sub par. I'd love to see it featured. Never mind! I just saw the article on it. Thanks! We made these at the end of a shoot, and it was a perfect way to end the day. Thanks Erik! 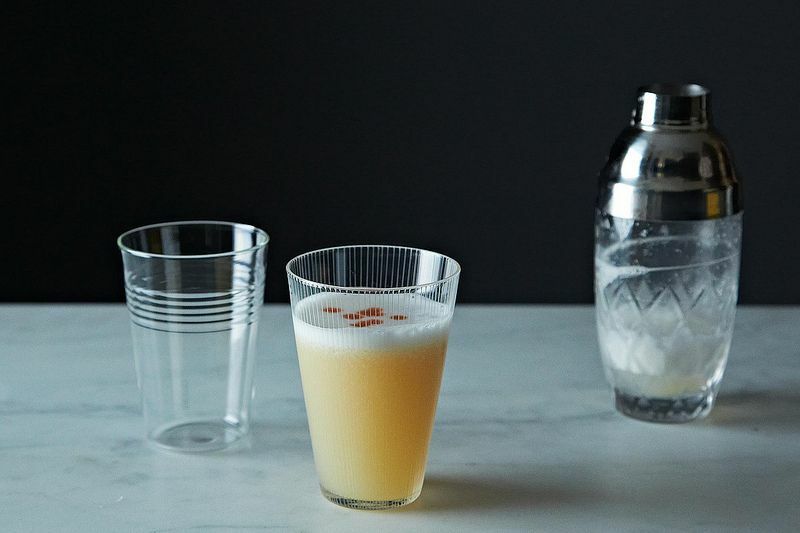 While Angostura isn't part of the recipe, the Apple Blow Fizz, like many fizzes, benefits from a few dashes or drops of bitters on the surface. The egg white raft holds the bitters on top so you get a noseful of aromatics on each sip. You can even drag a toothpick through the drops to make designs if you want to get super-fancy. Delicious! Is there a source for that cut-glass cocktail shaker in the photo? So cool!